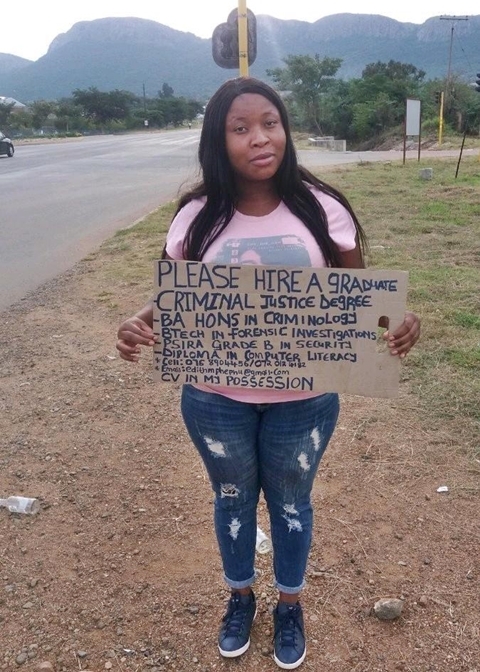 A female Twitter user identified with her handle as‏ @MokoenaDee, has taken to the social networking platform to share the photo of a desperate graduate begging for a job on the side of a road. The photo which was attached in the tweet making the rounds online, shows the graduate holding a placard that displayed her qualifications. The unnamed lady revealed in the placard that she holds a BA in criminal justice, BA (Hons) in Criminology, BTech in forensic investigation, and a Diploma in computer literacy. As at the time of filing this report, it is unclear where the graduate is located, but the photo has been retweeted over 2,000 times in a bid to publicise her plight.